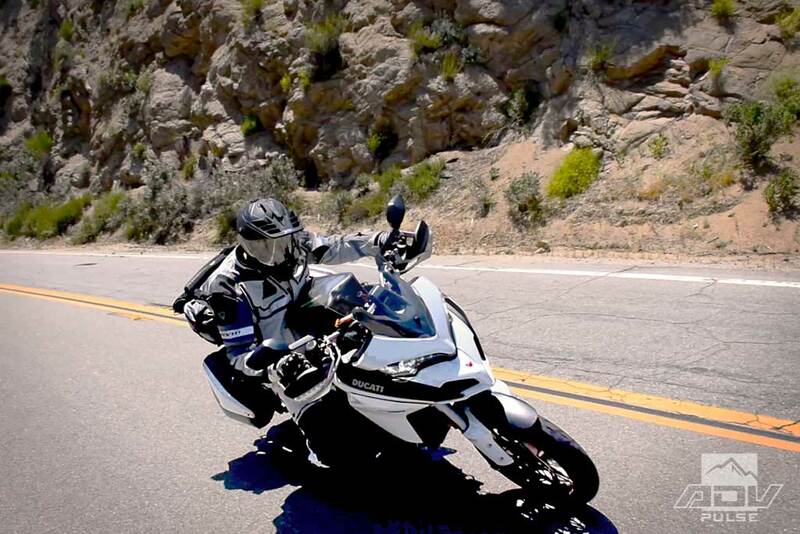  This sporty adventure tourer is one spicy Italian meat-a-ball. There are certain sounds that touch some intangible part of your being. It isn’t so much that we hear them, we feel them with our whole body. 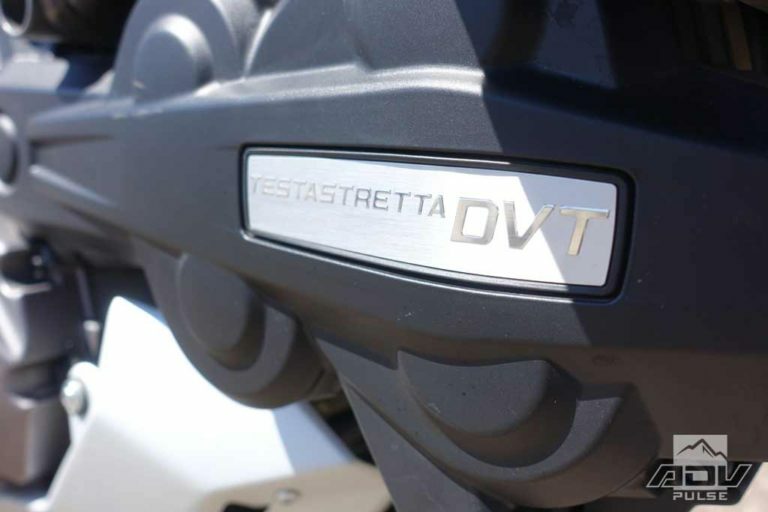 In the motorcycling world, there are few as iconic as the chest-thudding rumble of a Testastretta DVT engine. The Ducati Multistrada 1260 S has that desmodromic L-twin that has made every Ducati famous both visually and auditorily and it is wrapped around an adventure bike that has very close relations to a full blown street fighter. There are a number of bike models in the Ducati Multistrada line. The Multi’s that you might be more familiar with are the Enduro models that fall closer to the dirt end of the street-only/off-road spectrum. The 1260 S has a larger displacement than the Enduro line (1262cc compared to 1198cc) and is geared more toward sport touring than true 50/50 dirt/street riding. Another main difference is that the 1260 S has a single-sided swing arm while the Enduro has the more common dual sided. Lastly, the Skyhook semi-active suspension has 6.7 inches of travel compared to the 7.9 on the Enduro Multi. 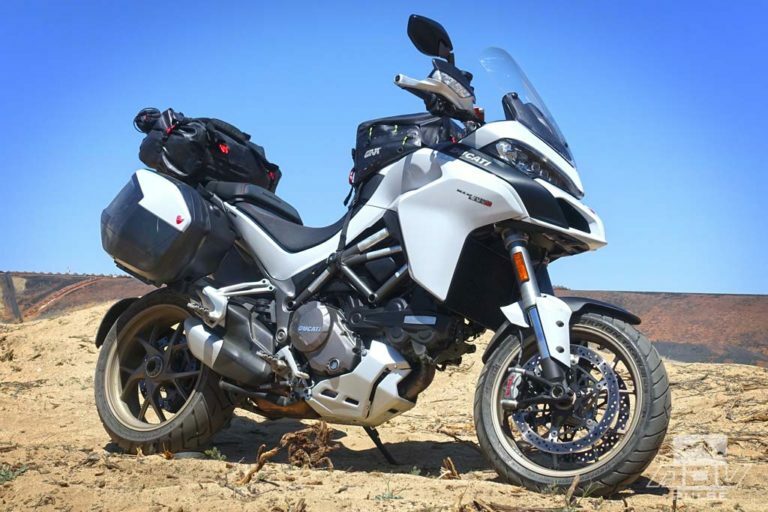 The Multistrada 1260 S is a fancy machine, which is pretty much on par with all of the top-tier adventure bikes on the market. It depends on how you prefer your motorcycle if you think it is overly complicated or very well-equipped. 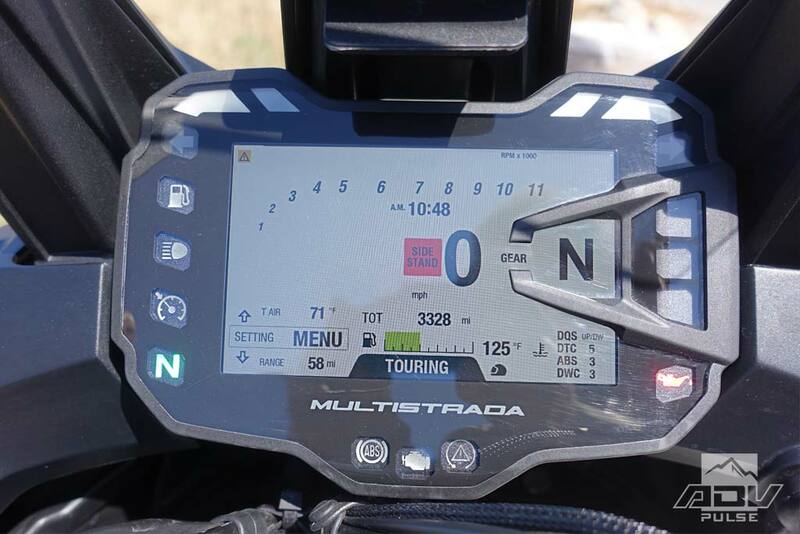 The dash is basically a computer screen (TFT) that is where you make all your choices and adjustments for how you want the bike to ride. The menu architecture is a little less intuitive than some other bikes but there are a ton of options. This gripe would most likely go away if we owned the bike and had longer to truly become accustomed to all the menus within menus. There are four ride modes; Sport, Touring, Urban, and Enduro and each ride mode affects both the power output and delivery, as well as the suspension settings. You can change ride modes on the fly, but can’t make fine adjustments while riding. For example, if you are in Sport mode, but want softer suspension because the road is getting rough, you can’t adjust the suspension settings while you ride. You can, however, fine tune the suspension setting in each mode if you pull over and are idling or have the engine off. Each ride mode has preset fork and shock damping settings that you can then adjust up or down independently on the fork and shock. Once you do this, it is saved in that particular ride mode. There is also an electronic sag setting that will adjust the preload on the spring for single rider, single rider and luggage, double riders, and double riders and luggage. Each ride mode also has its own setting for the ABS and traction control, which can also be adjusted in each mode manually, but not while riding. 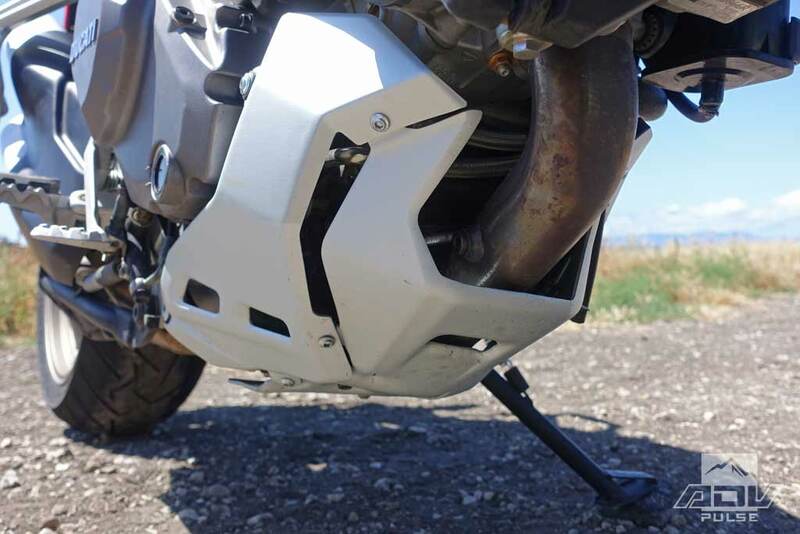 Part of the ABS system is also an anti-nose-wheelie system that doesn’t allow the rear tire to lift off the ground if you grab way too much front brake. 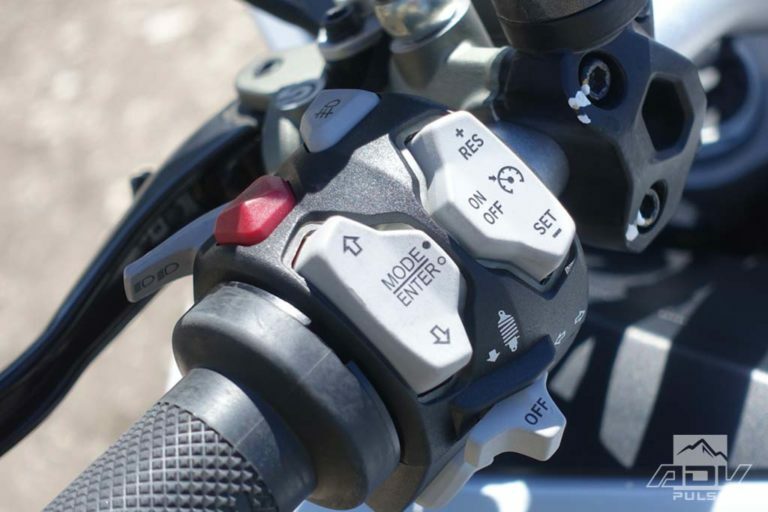 This is turned off in Sport and Enduro riding modes to give maximum control to the rider, but stays on in Touring and Urban modes where safety is the primary concern. If you haven’t heard of Ducati’s Skyhook suspension, it has nothing to do with planes. The way the Italians explain it is, you can imagine the bike is suspended by a single hook with ropes attached to the front and back of the bike. The suspension is actively trying to keep the bike balanced and level in relation to the “hook” the bike is hypothetically suspended from. To do this there are sensors all over the bike including suspended and non-suspended components. For 2018, the Multistrada 1260 S has new forks and new suspension sensors. 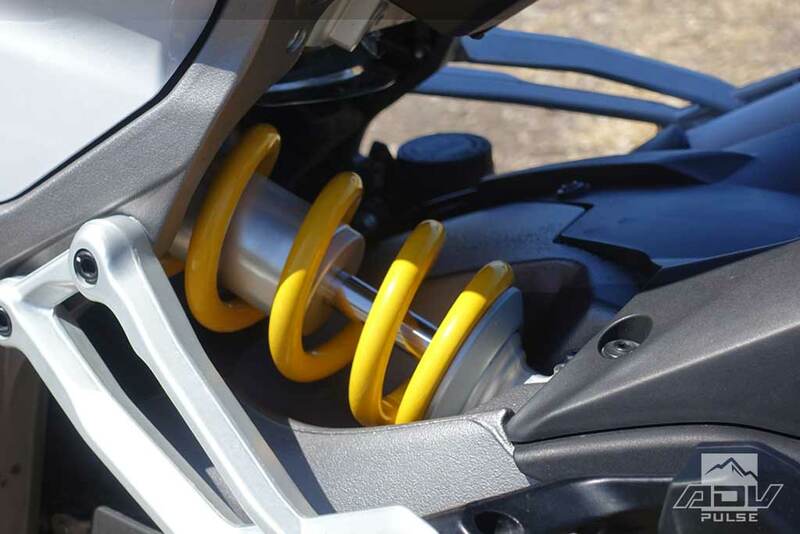 Both fork and shock are made by Sachs. 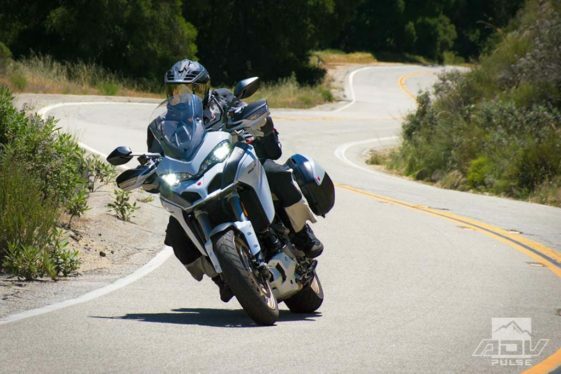 A sport bike lineage is easily noticed when you hop on the Multistrada 1260 S. The modest 32.5 inch seat height (in the low position) makes it very easy to flat-foot at stops even for shorter riders. The seat itself is very scooped out and the bike has an exaggerated, yet not unpleasant, “sit-in” feel. This puts the riding in a sporty position whether you want it or not. The footpegs are slightly farther back than some other adventure bikes, further putting the rider in canyon-carving mode. The handlebar has a pretty good sweep back to the rider and is less flat than dual-sports or other ADV bikes. Taking on the curves of lonely highways, the Italian superbike spirit comes alive in the Multi 1260 S. With the sporty ergos, you can’t help but lean off the inside of the bike and slice through the apex of every turn you come across. The bike is extremely responsive to rider input – almost to the point where it demands a certain level of skill to hold a consistent line in the corners. Not that it’s trying to push or understeer, just that it will respond to any rider input even when banked over in a turn. Adjusting your line midcorner is sometimes difficult on other ADV bikes but the Multi will react with immediacy and carve tighter or wider, which ever you tell it to do. 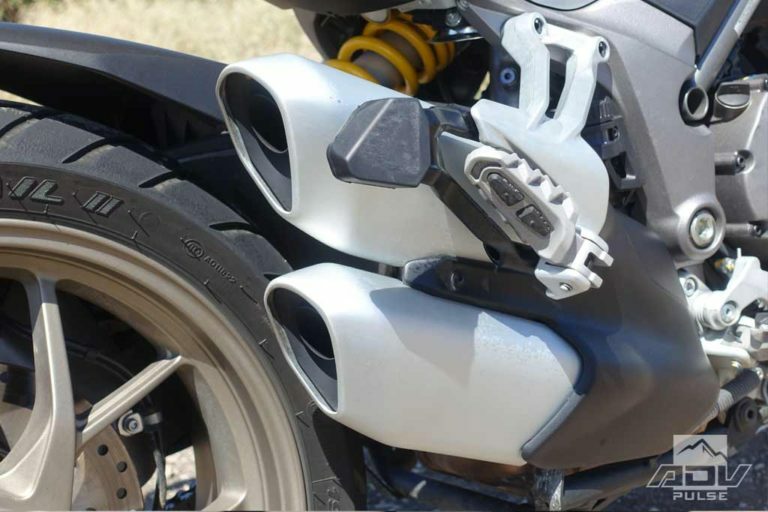 If you come from the dirt or aren’t used to sport bike turning characteristics, the front end will feel twitchy (but not unstable). Yet with practice, that same feeling will turn into precision and maximum control. Even though it is a 518-pound bike, it feels very agile and flicks from corner to corner, begging you to twist the grip a little harder and lean a little further. The easier it is to lean the bike, the sooner you are scraping the pegs, which isn’t hard to do on the 1260 S. Its modest 6.6 inch ground clearance doesn’t help this situation. You might think that with such impressive street credentials the Multistrada would struggle in the dirt and you are right… and wrong. The same characteristics that make it so sporty (low seat height, responsive handling) also make the 1260 S less intimidating off-road than taller, longer-suspended machines. Handling wise, the 17-inch front wheel with the stock street tire was the biggest issue off-road and would want to either dig into soft dirt or sand, or wonder around on hardpack. But, when the speeds were slower and we were picking our way up some rocky dirt roads, the nimble handling helped us to maneuver the bike and the low seat height kept our confidence up. Standing isn’t as natural or normal feeling as other adventure bikes. The slightly rearward pegs and low handlebar do allow for stand-up riding but it doesn’t encourage it. That beautiful exhaust note comes from a beautiful amount of power. The Multistrada 1260 S’s motor puts out gobs of grunt across the rpm range, yet is the happiest at either the bottom or the top-end. As you roll on the throttle, the bottom-end power pours out with an abundance of torque in a thick, chuggy nature. In the mid-range, the power is OK, but nothing really that exciting. Then, as you get closer to 7,000 and 8,000 rpm, the two cylinders belt out together and push your eyeballs back in your head. You could ride the twisties either short shifting and lugging, letting the torque do the work, or revving it out and getting super aggressive (just bring a change of underwear). Snicking into gear was a delight with the quickshifting option for both up and down shifts. Sport mode is, obviously, the most aggressive and was the mode we preferred most of the time. Touring mode would be useful for two up riding or when heavily loaded since it gives you the full 158 HP (like Sport) but just mellows out the delivery making it easier to control. In Urban and Enduro, the HP is cut down to 100 HP and the power delivery is also metered down. A combination of making more power at the top end of the rev range and that the Multi seems to have a pretty significant front-end weight bias, means that wheelies aren’t as easy as some other 1200 plus machines. As we mentioned earlier, each ride mode comes with its own damping settings for the suspension that can be stiffened or softened (the fork and shock independently) as well as four preload settings that can also be fine tuned in small increments. There is a ton of adjustability and, unlike some other bikes, it was easy to feel the difference in each ride mode. 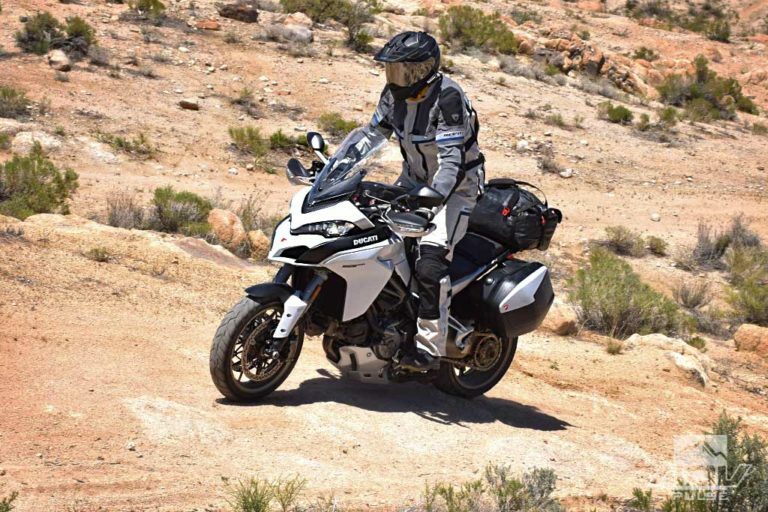 In Sport mode, there is just a touch of front-end dive when getting on the binders, which is helpful for front wheel traction and to shorten the wheelbase. Yet there is no detectable squat when getting back on the gas. We also adjusted the suspension to its softest possible setting and it was very plush – a noticeable increase in suspension movement and compliance. But, this also gives the bike some front-end dive and rear-end squat and a bit of a wallowing when going through dips in the road. Also, when off-roading the bike, the low ground clearance combined with the softest suspension setting means you have to back down the pace to avoid bottoming out. Plus riding a beautiful bike like the Multistrada off-road came with a little extra trepidation anyway, causing us to take it down a notch even when it’s capable of more. 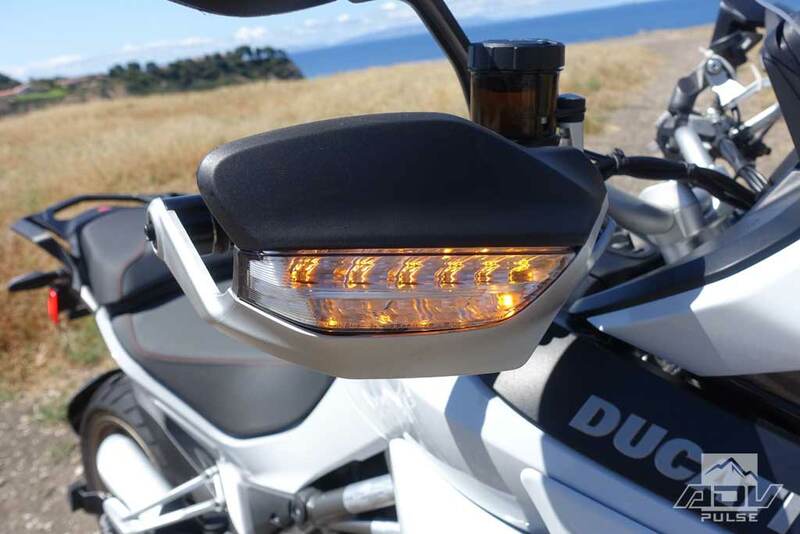 Comfort for the long haul is in no way lacking on the Multistrada 1260 S. The heated-grip button is right on the bar and they work great. 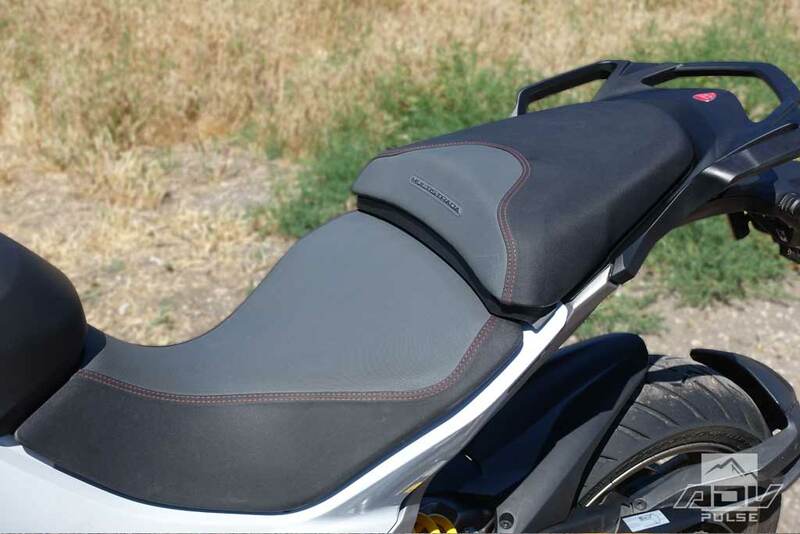 The windscreen is one-hand adjustable and easy to do while riding. It did a good job of creating a bubble of clean air for the rider, and the handguards are pretty big providing a lot of wind protection. The large, very stable mirrors are also usable at any speed. Humming along in sixth gear, the L-twin has nearly no vibration and the rpms are pleasantly low. Taking over for the right hand, the cruise control is very easy to use. Each push of the plus or minus buttons equal one mile an hour faster or slower. And for such a nimble bike in the corners, high-speed stability was also top notch. To get the best fuel mileage, we put it in Urban mode when the “miles to empty” indicator dropped past 30. The fuel gauge is actually very accurate since we did push it until it said we only had 4 miles till empty. When we filled up, the 1260 S took a shade less than the 5.3 gallons it claims to hold. In Sport mode, while riding aggressively, the bike guzzles fuel fast. We would only get about 150 miles on a tank. As long as the key fob is near the bike, the ignition switch will spark the bike to life. 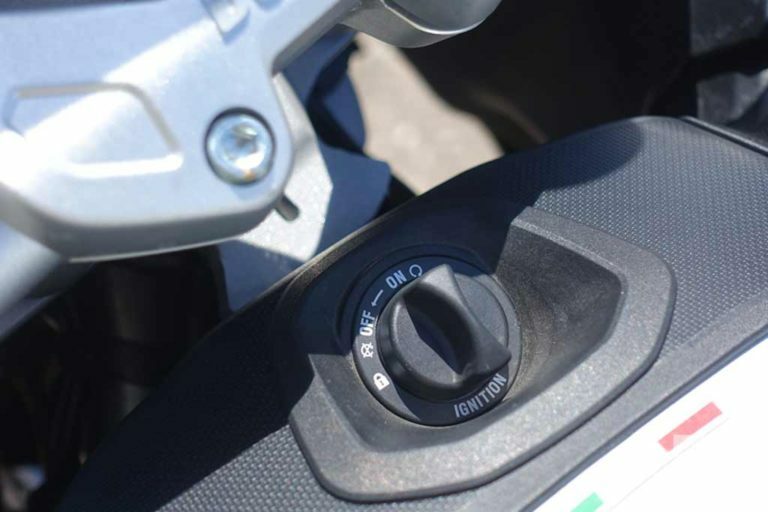 There are two charging ports on the bike – a regular 12-volt charger under the passenger seat and a powerlet port behind the fairing at the front of the bike. The plugs are not on all the time and only work when the bike’s ignition is on. You don’t need to turn a key to start the bike, as long as the key fob is near the machine, the ignition button will spark the bike to life. Something to remember with the key fob situation; if you start the bike while the key fob is near, say on your workbench in the garage, and you ride away, the bike will continue to operate like normal. That is, until you shut it off. But Ducati has thought of this and you can start the bike with a four-number PIN you can choose. You’ll still be out of luck if you need to put gas in the bike since you need the key to open the cap. 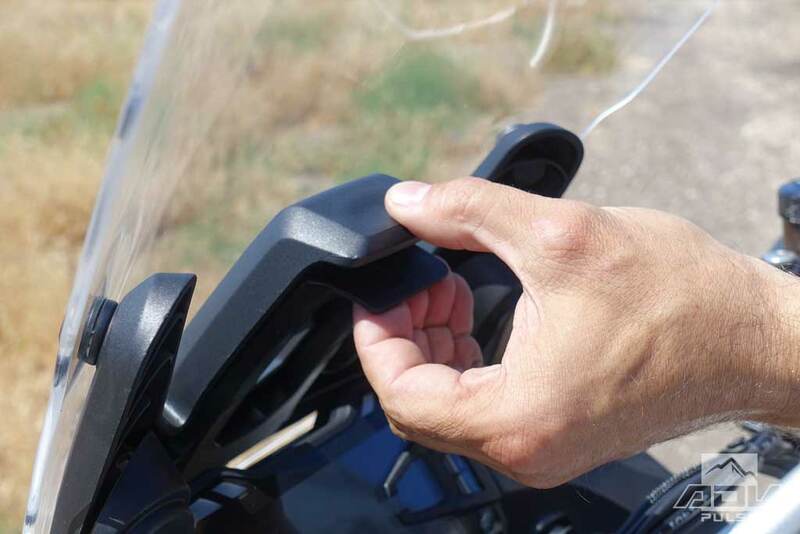 The one-hand adjustable windscreen is easy to use while riding – just pinch and slide. There is minimal off-road protection and it isn’t the beefiest. 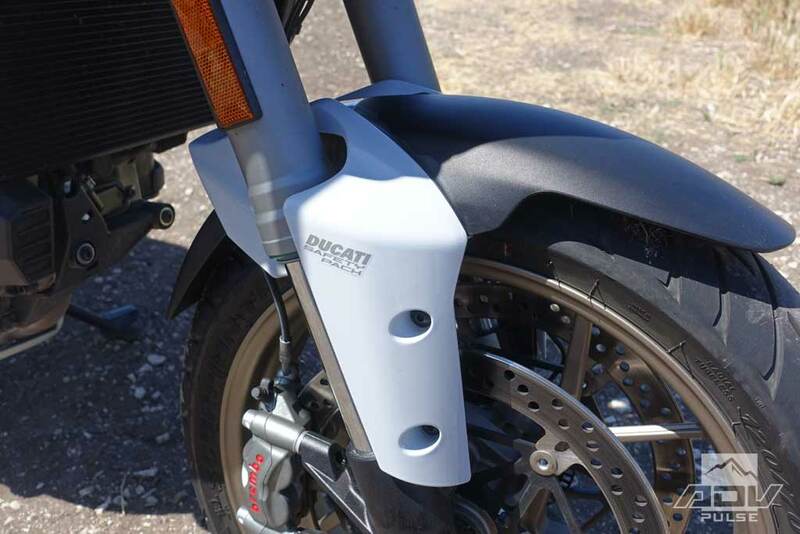 While the skid plate is a cool design and should be pretty sturdy being made of metal, the handguards are not. We found that out first hand when a solid-looking stump that we put the side stand on crumbled like stale bread. And, since the turn signals are integrated in the handguards (now in multiple pieces) reconstruction was a little tricky. After some JB Weld and zip ties we were back in business. The biggest surprise riding this bike wasn’t that it was a absolute monster in the twisties, or that its power made us shudder with fear in the higher rpms, it was that the low overall stance of the bike and agility made it an accessible off-road explorer. No, you aren’t going to go fast off-road with 17 inch cast wheels, low ground clearance and stock street tires, but you can go many places that other adventure touring bikes can, just at a slower pace. And with maybe some paddling involved. Riding this bike reminds us of what made us like motorcycles in the first place. The iconic Italian exhaust note sings out and beckons for the open road and we are more than happy to oblige. 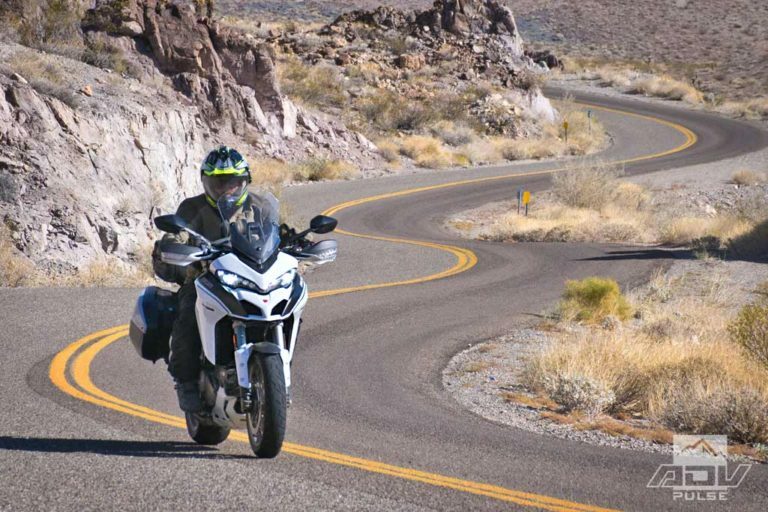 The combination of all day comfort, true sport bike performance, ability to explore in the dirt, and little touches of Italian style make the Ducati Multistrada 1260 S a machine worthy of any adventure tourer’s consideration. I wish they bring the 1260 Multistarda Enduro for 2019, I love my 2016 but envy the torque curve of the new motor and it’s up-down quick-shifter transmission and dash interface. Now, where is that money three?